From now until June 9, Yun Yan is offering two Sichuan-style rice dumplings inspired by chef Kenny Chan’s signature dishes – braised pork belly with pickled chilli and beef brisket – at $98 each. The reinvention of the classic dishes with the flavours of star anise, homemade pickled chilli and ginger promises exciting new possibilities and tons of spice. Shop 1001B, 10/F, Times Square, 1 Matheson St, Causeway Bay, 2375 0800; miradining.com. 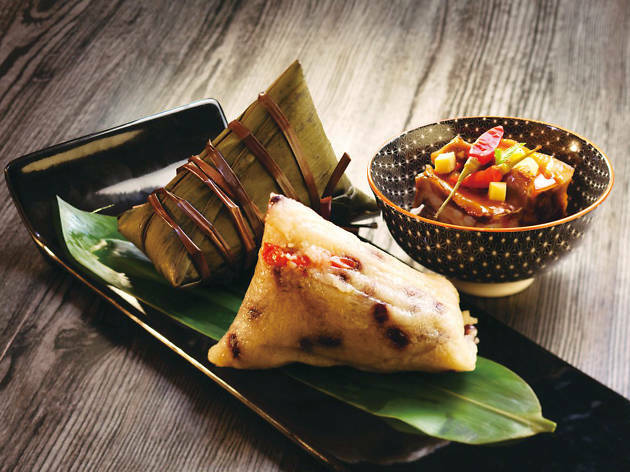 Pamper your taste buds with rice dumplings made from ingredients fit for a king this Dragon Boat Festival at The Royal Garden. Choose from options like the supreme black truffle and Parma ham rice dumplings ($218), Kagoshima pork and dried sakura shrimp rice dumplings ($218) or the Okinawa black sugar, sweet potato puree and black glutinous rice dumplings ($118) for those in possession of a sweet tooth. Until Jun 9. B2, The Royal Garden Chinese Restaurant, 69 Mody Rd, Tsim Sha Tsui E, 2724 2666; rghk.com.hk. 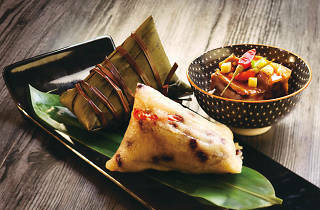 Chef Mok Kit-keung of Shang Palace is experimenting with an array of fusion sticky rice dumplings available at the Kowloon Shangri-La until June 8. Try the Buddha Jumps over the Wall dumplings ($288), inspired by the traditional Chinese soup of the same name, and the Uji matcha and red bean dumplings ($78), which provide a Japanese twist. Kowloon Shangri-La, 64 Mody Rd, Tsim Sha Tsui E, 2721 2111; shangri-la.com.